We’re fitness people, so you might think our holiday traditions are packed full of fun runs and other healthy traditions. Do we avoid grilling due to the cancer risks associated with charring meat? Maybe we pass on the ribs, corn on the cob smothered in butter and potato salad? If you answered yes to these questions, you guessed wrong. We engage in the delightful indulgence of all the traditional staples, whether they are calorie laden or not. Some do shoot for moderation and head towards healthier choices but most seem to just enjoy all the offerings of the day regardless of the calorie count. Do we actually still get a workout in on the 4th of July? Well, this is a little different. It may not be the standard workout but many of our staff enjoy the day by engaging in activities with family and friends. 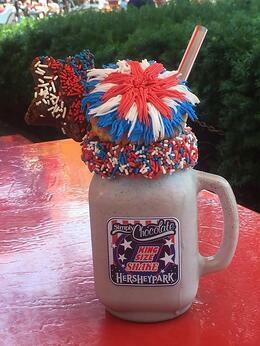 Corey in Pennsylvania indulges in a mountainous heap of sugar and dairy called the Star Spangled King Sized; Cookies and Cream Milk Shake, topped with a star shaped brownie and pop rock filled cupcake. Bethany’s choice each year is a simple trifle layered with delicious berries, instant vanilla pudding and whipped topping. Keith in Indiana has a deep seeded taste for watermelon, (see what I did there?) so anything with that fruit is up his alley. Check out the Watermelon Salsa below that he’ll be making this year. Looks pretty tasty to me! Add a splash of lime juice, serve with your favorite corn chips. Bethany had a once in a lifetime chance to see the 4th of July fireworks in Washington DC years ago that still ranks as her favorite fireworks display of all time. Kara heads to Tennessee with her family to enjoy long days on the lake that close with an eagerness to do it all over again the next day. Lisa in Indiana has a tradition of starting the day at the lake in South Haven, Michigan, taking an easy jog with her dad to enjoy the cool breeze off the lake. Christy keeps it simple by enjoying a simple ride to her local park on the 4th of July. 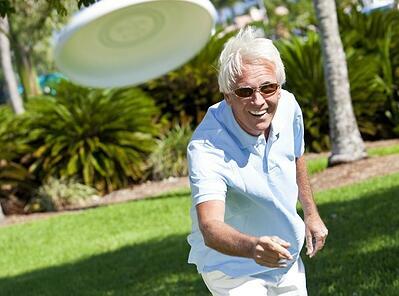 Dan in Indiana also mixes activity into his day with his family such as volleyball, lawn games, and wake boarding. 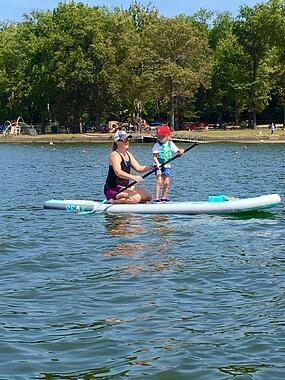 Joy makes her way across the lake with her son for some paddle boarding and then back to the campsite for the evening. Lindsey is ready to run with the baton and take on the family party at her house this year after 20 years of it being hosted at her parents’ house. There they will celebrate with up to 50 people by enjoying a fish fry, badminton, croquet and corn-hole. She’s get our hostess with the mostest award. Cathy’s brother-in-law in Florida is on the local fireworks crew so their family gets an up close experience every year. Plenty of our staff enjoy the traditional parade as well. I think we all love to see the marching bands, festively decorated floats, horses and most of all our military marching with pride. My daughter and I place small flags on the headstones of those who served in our military and then go to any fireworks show in Denver and spend time with friends and family. On behalf of the NIFS organization and our staff, we salute our men and women who serve our country and give us the opportunity to enjoy our daily freedoms. We offer our most sincere THANK YOU and are extremely grateful for your service. Resident wellness programs have been on the rise in senior living as consumers demand more robust and holistic options for living well. Despite the market's increasing infatuation with branding and labeling wellness in the community setting, I think the industry has a lot of room to continue to grow so that we're building programs, services, staffing, and amenities in a way to facilitate residents' desires to live well. Following are some common pitfalls that result in dated or stunted wellness programs, along with ideas for how to evolve past those sticking points. 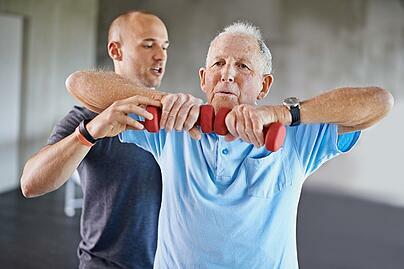 Your exercise program is not the same thing as your wellness program. In the consulting work I do, it is so common for communities to point to their exercise classes as the primary example of how they are offering their residents a wellness program. And while I would agree completely that the exercise program is a key to a successful wellness strategy, it's not the only element; and for some communities, it may not even be primary. You absolutely want the exercise program to serve many of your residents, but it's important to acknowledge that not all of your seniors will participate. The class offerings, individual services, exercise equipment, and related amenities need to be diverse and well communicated. There should also be effective resident outreach to consistently draw in new participants. Even when communities are executing well with their program, there is often room for improvement within the exercise offerings. Class formats and descriptions can be reviewed, and fitness center services like exercise prescriptions and fitness testing should be evaluated. Even taking a closer look at replacing small, worn-down equipment can offer subtle but positive upgrades to your program. A full activities calendar is the wrong goal for your wellness program. I think sometimes folks in the activity director role find themselves in the position of order taking—you’re catering to the vocal minority. And who can fault you for wanting to make your constituents happy? But there are traps and pitfalls for your resident wellness program if your activities and events are built from an order-taking model. Sometimes one of the challenges with the philosophy on how events and programs are placed on the schedule is actually cultural in the organization. We set the wrong benchmarks for evaluating effectiveness in activities. We focus on how full the calendar is, or leadership communicates that the goal of the activities staff is to make sure the residents are busy, that they have something to do, that we’re making their days pleasant and full. But if you stepped back and looked objectively at the unique elements on your last six months of activities calendars, is there anything on there that would interest you? Is there anything on those calendars that, if you were new in the environment and were looking to try to make friends, you might venture out of your apartment to attend? When you do program planning from residents' limitations, you limit your program. It's easy to get into a rut in senior living where you start to see more limitations from your residents than potential, and when we get trained on what seniors can't do, we unintentionally build programs around those perceived barriers. We tell ourselves a story about the residents; we say they’re frail, they’re limited, they don’t like to leave the community, they don’t like change. We say we tried that program and the residents won’t do it. While you may have some residents who are frail, limited, unlikely to try new things, fearful, or begrudging of change, you also have residents who can be described with a whole host of other adjectives like adventurous, bright, eager, optimistic, friendly, kind, enthusiastic, loyal, and patient. Evolving your activities and exercise programs may require a full-scale change in how you view your residents' desires, passions, and abilities. Stripping old assumptions is never easy, but it could be the first step toward building a better wellness program for the community. Someone recently asked me, “What is your favorite workout?” I thought about my answer for a little bit. I do like to run, and I usually run about three days a week, but is that my favorite workout? No, my favorite workout is always when I’m trying new exercises or activities! The workouts that I enjoy the most are the workouts that I haven’t tried before, or don’t get to do very often. 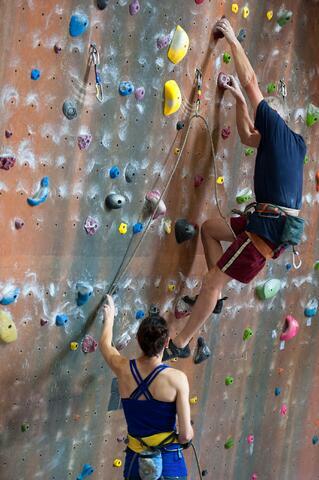 Whether it’s a new obstacle course race, running a newfound path, hiking a new trail, indoor rock climbing, stand-up paddle boarding, a taking a new Barre class, or just changing up a high-intensity interval workout, new workouts and exercises can be challenging and fun. I’m like most people, I think, and doing the same workout day-in and day-out can get old. Like I said, I still run about three days a week, but I also try to mix it up with new workouts on a regular basis. I recently went to an indoor trampoline park with my kids. I had so much fun! I also had no idea how sore I would be the next day, simply because I was having too much fun to realize how much of a workout I was really getting. Besides being fun, switching up your workouts and trying something new can have lots of other benefits. Changing your workouts regularly can help break through the dreaded weight-loss plateau. It can also help prevent overuse injuries and build new muscles that you don’t use during your typical workouts. Continuously trying new workouts can help build your confidence and keep your brain healthy. When you learn something new, it can help you feel empowered, more confident and ready to learn other new skills. And, learning new skills helps keep your neurons firing and your brain sharp, and helps to prevent memory loss. Group fitness classes—Vinyasa Yoga, Zumba, PiYo, Boot Camp, Barre, etc. Sign up for a 5K or a 10K, or challenge yourself to a half or full marathon. Water sports—skiing, paddleboarding, kayaking, whitewater rafting, etc. What are some activities that you have recently tried or would like to try? Get your employees moving more! Grab this free download for 7 ways you can add exercise to the workplace. 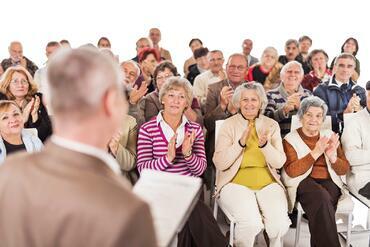 One of our clients put the Alzheimer’s walk on center stage this year, and the residents responded with gusto! Paul, NIFS fitness center manager at Meadow Ridge, knew he wanted to create programming around the area walk from a fitness perspective, but he was also interested in building a synergistic event that involved both employees and residents, many of whom have been personally touched by a loved one with Alzheimer’s disease. It was their first time raising money for a cause, and they weren’t sure what to expect in the way of participation. But with thoughtful planning and a team effort, this year’s event was a success. Here’s a rundown of how they executed a $4,900 fundraiser for Alzheimer’s disease research on their very first try. Paul initially set out with a personal brainstorming session to consider options and overall structure of what he wanted to offer. With that outline in hand, he met with both the administrator and the executive director. By the end of that meeting, they had a variety of fund-raising ideas on the table. Most importantly, he had the support of the resident health services director and the activities director to pull off the plan throughout the month of September. Paul started with a letter to the residents about what was coming. He mentioned the community’s support of the Walk to End Alzheimer’s in their area, and provided some basic facts about the impact of the disease. He provided a teaser in the letter to pique their interest and encourage them to watch for another communication outlining how they could get involved. He followed that letter with another print communication announcing himself as the captain for the Meadow Ridge walking team, and invited residents to participate in either a walk at Meadow Ridge or the three-mile designated Walk to End Alzheimer’s in their area. He also outlined information about how to make a donation and included an envelope complete with a receipt for tax use and a return label on the front. All they had to do was write the check, seal the envelope, and return it to the receptionist. Two days after the second letter went out, they hosted a root beer float day. That was a brand new activity for Meadow Ridge, and it successfully inspired recollections of childhood for participants. At the float-making station, they had reminders about making donations using their envelopes, and they also had a donation jar. They quickly raised almost $300 in cash at that 90-minute event. The next week the community offered two different fund-raising events. 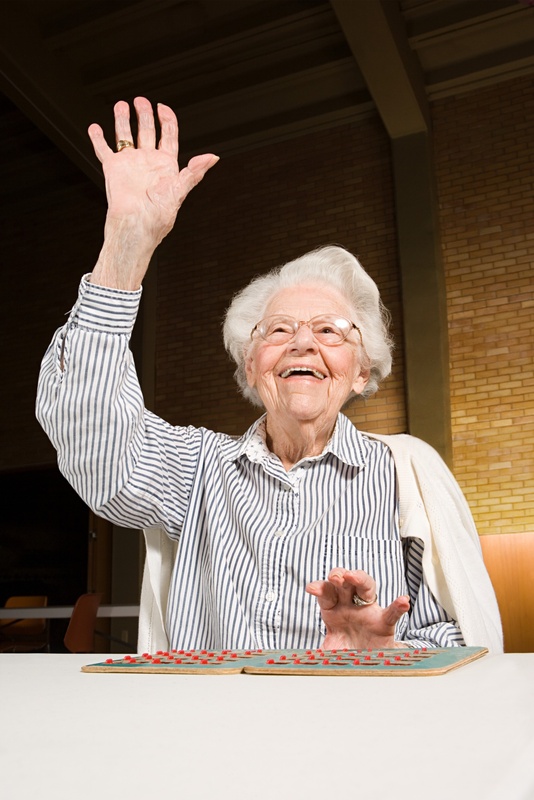 The first was a resident-only bingo party where the cost to play was $5 per game. Of course, great prizes were offered to those who won each game. They also held a 50/50 raffle with employees. 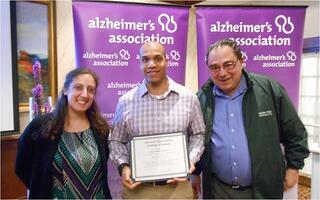 This event raised $206 in total, where $103 went to the winner and $103 was donated to the Alzheimer’s Association. The last week included a raffle for 30 different prizes for home services like gardening and housekeeping. There were also dinner-for-two prizes and opportunities to win a personal assistant for a day. The grand prize was dinner for three residents with the community owner. Some of the prizes were internal services offered by Meadow Ridge staff, while others were from outside vendors who wanted to participate in this important event. In the end, they had participation from about one-third of the residents, and a team of 79 residents and employees joined in on the walks for a total of 64 miles. And to top off all of the enthusiasm around this fund-raising, the Alzheimer’s Association recognized the community for their creative efforts. The whole thing was such a hit, they are already dreaming of what they can accomplish next year! Our staff put their creative ideas into their programming to help increase resident participation, click below to see how you can improve your programs.